This bull is proving to be stronger than most analysts had anticipated. Even in the midst of Friday's strong counter-trend tendencies and disappointing home sales data, stock index futures continued to maintain a bullish bias. On the futures side of things, traders are only holding mildly bullish bets (according to the CFTC's COT Report) and this leaves some room for further gains (not everyone is on the band wagon), yet in equities it seems the bus has gotten too full. Such an environment is tricky because even though the best trade in the intermediate term is likely from the short side, the near-term pain thresh hold could be high. We are hearing that fund inflows into equities have been more than substantial. In fact, it appears investors are allocating money to the stock market at a pace not seen since 2007, just before the financial world came crashing down. Similarly, investor sentiment readings such as the one conducted this week by the American Association of Individual Investors portray a market in which there are simply too many bulls. According to the latest reading, the index pegs 52.3% of investors as being bullish. I realize this doesn't sound significant, but it is historically high. The long term average reading is 39%. Although 52% isn't necessarily egregious it is certainly a red flag. On the same note, only 24% of investors are bearish; this signals a market in which the bulk of the buyers might already be in and shorts out (don't forget short covering often pushes prices up). The 30-year bond futures broke through support (defined by a price wedge) and never looked back. Today was option expiration, so that might have played a role, but we suspect there will be follow through selling early next week as traders are beginning to feel better about the prospects of recovery in the Eurozone. Speaking of Europe...it has been months since we've experienced a panic cycle stemming out of the region. Similarly, the Euro currency which was all but stricken from existence in 2012 is making an impressive comeback. Nonetheless, markets and, therefore, market sentiment, move in cycles; complacency is running rampant. We are overdue for a little bit of fear. Accordingly, we aren't fans of selling Treasuries into the hole. 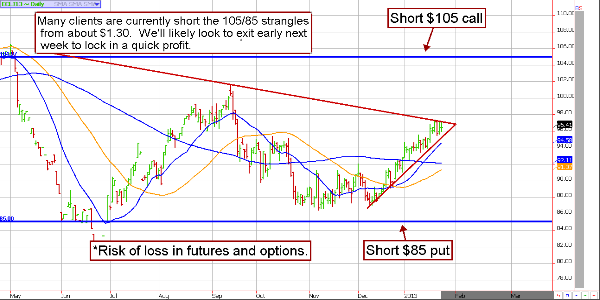 We like waiting for moderately lower prices before we'll consider turning short-term bullish. **Consensus:** The cheap, might get cheaper. 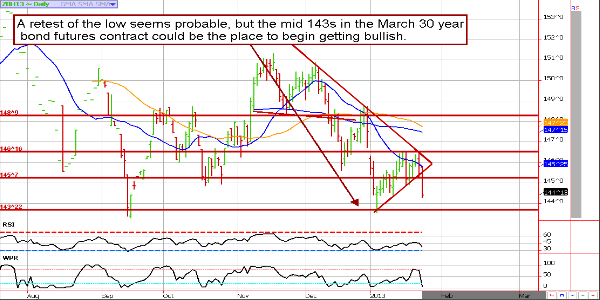 We're looking for mid 143s in the long bond before considering being bullish. This is the million dollar question. In yesterday's newsletter we noted that new highs in the indices in today's session would likely lead to a move to the next resistance area. In the case of the S&P, which is the broadest and most telling index, Friday's session failed to see new highs. This leaves us cautiously bearish going into the weekend. With that said, traders playing the short side should be willing to assume the risk of a move to 1511, which is the next major area of resistance. **Consensus:** The bulls won't give up, and the bears are throwing in the towel. 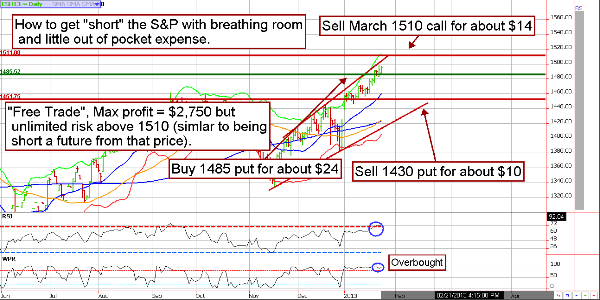 The move is over-done, but that doesn't mean we won't see 1511 before the rally runs out of steam. **January 4:** Sell March crude strangles using the $100 call and $84 put for about $1250 in premium.